Israeli forces continued with systematic crimes in the occupied Palestinian territory (oPt) for the week of 25 – 31 May 2017. 7 Palestinian civilians in the Gaza Strip were wounded during activities supporting Palestinian detainees in Israeli jails, while Israeli forces continued to target the Gaza Strip border area. During the reporting period, Israeli forces wounded 8 Palestinian civilians, all of whom were wounded at the border area in the Gaza Strip. Moreover, Israeli navy forces continued to chase and open fire at Palestinian fishermen in the Gaza Strip sea. In the West Bank, Israeli forces continued to use force against peaceful protests, but no casualties were reported. In the West Bank, the majority of the West Bank cities witnessed protests in solidarity with the Palestinian prisoners on hunger strike in the Israeli jails. Israeli forces used force against these protests and other protests against the annexation wall and settlement activities. As a result, dozens of Palestinian civilians fainted because of tear gas inhalation. No casualties were reported. In the Gaza Strip, the border area witnessed protests supporting the Palestinian prisoners on hunger strike in the Israeli jails and rejecting the illegal closure imposed on the Gaza Strip. Israeli forces used force to disperse the protestors, due to which, 8 civilians, including a child, were wounded. Seven of them were hit with live bullets and one was hit with a metal bullet. In the context of Israeli attacks on fishermen in the sea, on 26 May 2017, Israeli gunboats stationed in the sea, northwest of Beit Lahia village, north of the Gaza Strip, heavily opened fire at fishing boats sailing within the allowed area and chased them. Similar attacks recurred in the same area on 27 and 29 May 2017. No casualties were reported. On the same day, Israeli navy forces stationed off Gaza Port opened fire at the Palestinian fishing boats sailing within 4 nautical miles. Concerning attacks on the border area, on 29 May 2017, Israeli forces stationed in watchtowers around al-Mentar (Karni) crossing, east of al-Shuja’iya, east of Gaza City, opened fire at agricultural lands. However, neither casualties nor material damage were reported. During the reporting period, Israeli forces conducted at least 31 military incursions into Palestinian communities in the West Bank, and 7 others into Jerusalem and its suburbs During these incursions, Israeli forces arrested at least 48 Palestinian civilians, including 3 children. 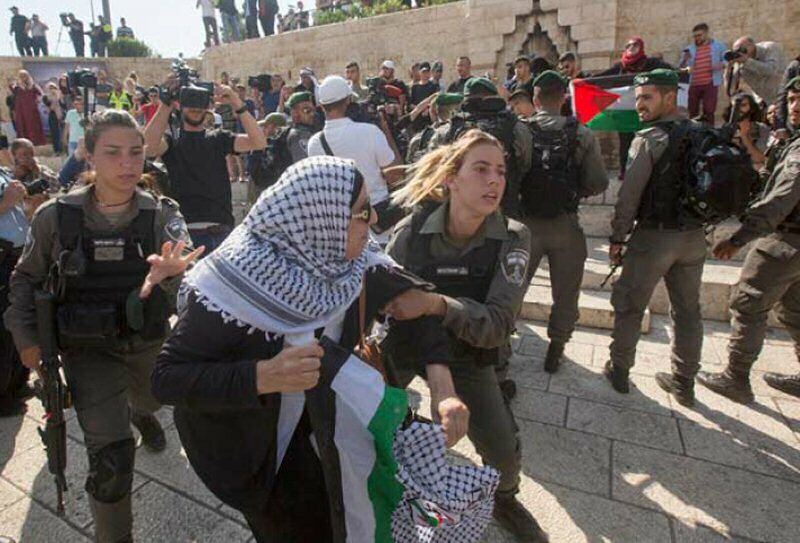 Twenty six of them, including 2 children, were arrested in occupied Jerusalem and its suburbs, while 5 civilians, including 3 children, were arrested while participating in protests supporting the Palestinian prisoners. The number of arrested persons this week raises to 53, including 6 children. On 27 May 2017, a number of settlers assaulted farmer Ma’moun Amin Nassar (44), from Burin village, south of Nablus, under the guardianship of the Israeli soldiers. They threw stones at him, hitting him in the head, back and right shoulder. Regarding settler attacks against Palestinian civilians and their property in Jerusalem, on 31 May 2017, dozens of settlers moved into Helwa valley neighbourhood in Silwan village, south of occupied Jerusalem, during a protest they organized marking the so-called “The Decent of the Torah“. The settlers threw stones at the houses, verbally insulted the residents in the area and damaged mirrors of some vehicles. Following the Friday prayer on 26 May 2017, dozens of Palestinian civilians and Israeli and international human rights defenders organized demonstrations in Bil’in and N’ilin villages, west of Ramallah, al-Nabi Saleh village, northwest of the city, and Kafer Qadoum village, northeast of Qalqiliyah, in protest against the annexation wall and settlement activities and in solidarity with Palestinian prisoners on hunger strike. Israeli forces forcibly dispersed the protesters, firing live and metal bullets, tear gas canisters and sound bombs. They also chased the protesters into olive fields and between houses. As a result, many protesters suffered tear gas inhalation while others sustained bruises as Israeli soldiers beat them up. Following the Friday prayer on 26 May 2017, hundreds of Palestinian civilians performed the prayer at the intersection of Bita village, south of Nablus, to support the prisoners’ demands in the Israeli jails. At the end of the prayer, a number of young men threw stones and empty bottles at the Israeli soldiers, who fired live and metal bullets, sound bombs and tear gas canisters at them and chased them between the agricultural fields. They then arrested Ra’ed Rashad Hamayel (39) from the same village. It should be noted that Ra’ed is the brother of Fahed Hamayel, a prisoner on hunger strike. At approximately 13:30 on the same Friday, dozens of Palestinian civilians gathered in the vicinity of Jaljoulia checkpoint established in the south eastern entrance to Qalqiliyah, in solidarity with prisoners on hunger strike in the Israeli jails. When the protestors approached the abovementioned checkpoint, the Israeli soldiers fired sound bombs and tear gas canisters at them. The soldiers then arrested 4 civilians, including 3 children namely Ra’ed Jamil Abdullah Dawoud (17), ‘Ali Mo’ayad Yusuf Shrem (17), Ghazi Abdullah Rafiq Nofel (17) and Omer Yasser Mohammed Shrem (21). Talal Abdul Qader Suleiman al-Najjar (33). He sustained a live bullet wound to the right leg. Mohammed Ibrahim Shabet (25) was hit with a metal bullet to the right hand. Around the same time, dozens of Palestinian civilians gathered into the east of Gaza, in response to calls for protests in the border area in solidarity with the Palestinian prisoners on hunger strike and in rejection to the Israeli-imposed closure on Gaza. A number of them approached the border fence and threw stones at the Israeli soldiers stationed there. The soldiers fired metal bullets and tear gas canisters at them. The clashes continued until approximately 19:00 on the same day. As a result, 2 civilians sustained live bullet wounds. They were transferred to al-Shifa Hospital in Gaza. Their wounds were classified as moderate. Around the same time, dozens of Palestinian young men made their way to the border fence between the Gaza Strip and Israel, east of al-Buraij, in solidarity with prisoners on hunger strike in the Israeli jails and in rejection to the Israeli-imposed closure on the Gaza strip. The young men gathered near the security fence, set fire to tires, raised the Palestinian flags and then threw stones at the Israeli soldiers stationed at the border fence. The soldiers fired live bullets and tear gas canisters at them. As a result, a number of civilians sustained tear gas inhalation and received medical treatment on the spot by the PRCS crews. On Thursday, 25 May 2017, Israeli forces established 5 checkpoints at the entrances to Samou’a, Taramah, Wad al-Shajnah and Jalajel villages. On Friday, 26 May 2017, Israeli forces established 2 checkpoints at the entrances to Halhoul and Sa’ir villages. On Saturday, 3 similar checkpoints were established at the entrances to Beit Ummer, Tarqumiyia and Raboud villages. On Monday, 29 May 2017, Israeli forces established 3 checkpoints at the entrance to al-‘Aroub refugee camp, at the southern entrance to Hebron and on Wad Abu Risha road in Ethna village. On Tuesday, 30 May 2017, 2 similar checkpoints were established at the eastern entrance to Dura village and at the entrance to Bani Na’iem village. Ramallah and al-Bireh: Israeli forces established (6) checkpoints all over the city. On Thursday, 25 May 2017, Israeli forces established 3 checkpoints at the entrance to al-Nabi Saleh village, northwest of Ramallah; under the bridge of Yabroud village, northeast of the city; and on the main street of “Beit Eill” settlement in al-Bireh City. At approximately 19:40 on Friday, 26 May 2017, Israeli forces established a checkpoint at the entrance to Um Safa village, north of Ramallah. At approximately 09:30 on Monday, 29 May 2017, Israeli forces established a checkpoint at the entrance to Um Safa village, north of Ramallah. At approximately 23:30, a similar checkpoint was established under the bridge of Yabroud village, northeast of the city. At approximately 10:05 on Friday, 26 May 2017, Israeli forces established a checkpoint at the northern entrance to Jericho. At approximately 20:00, a similar checkpoint was established at the intersection of al-‘Ojah village, north of the city. Qalqiliyia: Israeli forces established (2) checkpoints all over the city. At approximately 12:10 on Thursday, 25 May 2017, Israeli forces established a checkpoint at the entrance to ‘Azoun village, east of Qalqiliyia. At approximately 20:45 on Monday, 29 May 2017, Israeli forces established a checkpoint at the eastern entrance to Qalqliyia. Salfit: Israeli forces established (3) checkpoints all over the city. At approximately 14:50 on Friday, 26 May 2017, Israeli forces established a checkpoint at the northern entrance to Salfit. At approximately 22:50 on Sunday, 28 May 2017, Israeli forces established a checkpoint at the entrance to Deir Balout village, west of Salfit. At approximately 22:40 on Monday, 29 May 2017, a similar checkpoint was established at the western entrance to Dier Balout village, west of the city. At approximately 21:10 on Monday, 29 May 2017, Israeli forces stationed at Za’tara checkpoint, south of Nablus, arrested Mohamed Mahmoud Mousa al-‘Amour, from Bethlehem. At approximately 23:50 on Monday, Israeli forces established a checkpoint near the entrance to Kafur al-Deek village, west of Salfit, during which, they arrested Oraib Waleed Mahmoud Abu Salem, from al-Laban al-Gharbi village, northwest of Ramallah. At approximately 02:00 on Thursday, 25 May 2017, Israeli forces moved into Sh’ofat refugee camp, north of occupied Jerusalem. They raided and searched a house belonging to Zuhair Mohamed Abu Sinanah (24) and arrested him. At approximately 17:00 on Thursday, a group of undercover units of the Israeli police arrested Mohamed ‘Omar ‘Atiayh (16) and Mohamed Habash (17). The arrested persons were severely hit while they were in one of al-‘Issawiyia village’s streets, northeast of occupied Jerusalem. A member of a follow-up committee in the village of Issawiya, Mohamed Abu al-Humus, said that a vehicle of Israeli forces carrying Israeli undercover units and intelligence officers moved into al-‘Issawiyia village, where they assaulted two children and then arrested them. At approximately 21:30, Israeli forces moved into Hizmah village, east of occupied East Jerusalem. They surrounded the village’s mosque during Isha prayer and fired rubber-coated metal bullets and tear gas canisters in the vicinity of the mosque. In the meantime, the Israeli forces arrested 4 civilians and took them to an unknown destination. The arrested persons were identified as Amjad Omar Kan’an, Ghasan Omar Kan’an, Ghazi Bader al-Khateeb, and Ishaq Mostafa Jaber. At approximately 01:00 on Monday, 29 May 2017, Israeli forces moved into al-‘Issawiyia village, northeast of occupied Jerusalem. They raided and searched houses from which they arrested 15 civilians. PCHR keeps the names of the arrested persons. At approximately 01:30, Israeli forces moved into Shou’fat refugee camp, north of occupied East Jerusalem’s Old City. They raided and searched a house belonging to Mo’min Mohamed al-Dab’i (19) and arrested him. At approximately 02:40 on Tuesday, 30 May 2017, Israeli forces moved into Bab Hata neighborhood in occupied East Jerusalem’s Old City. They arrested two persons, who were identified as Bahaa Abdullah Najeeb (23) and Ahmed al-Bayoumi (21). At approximately 03:00 on Tuesday, 30 May 2017, Israeli forces moved into Baten al-Hawah neighborhood in Silwan village, south of occupied East Jerusalem’s Old City. They raided and searched a house belonging to Loai Yehia al-Rajbi (21) and arrested him. At approximately 01:00 on Wednesday, 31 May 2017, dozens of Israeli settlers moved into Wad Helwa neighbourhood in Silwan village, south of occupied East Jerusalem’s Old City. They organized a demonstration to commemorate the anniversary of the so-called “The descent of the Torah”. A Palestinian civilian ,Majd Ghith, said that dozens of Israeli settlers moved into the abovementioned neighbourhood and threw stones at the civilians’ houses. They also insulted the village residents and damaged their cars’ mirrors. After that, the village’s residents confronted them until the arrival of Israeli forces. At approximately 16:00 on Saturday, 27 May 2017, a group of Israeli settlers from “Yitzhar” settlement in Bureen village, south of Nablus, assaulted the farmer Ma’moun Ameen Nasar (44), from the abovementioned village, under the Israeli forces’ protection. It should be noted that while Ma’moun was grazing his sheep in “Khilat al-Nigasah” area, the Israeli settlers threw stones at him. As a result, Ma’moun was hit to his head, back and left shoulder. During which, a number of the village residents and members of the village council came and helped Ma’moun. He was then taken to Rafidiyia Hospital in Nablus.